Food is my first love and is largely responsible for giving me the big, strong body I have today. I have a very huge appetite and I eat unashamed, especially pasta, especially the one from Big Chill, especially their Penne with Bacon. I prefer my pastas to be all gooey gooey with extra cheese and pepper and mushrooms and bacon or chicken and spicy. Uuumm. I had pasta a week before I went to deliver Zoya. And since then, I’ve been off outside food. There were too many considerations – Singh can not eat spicy food and I am not allowed to, he is a die-hard vegetarian, I am not allowed half the vegetables this planet produces for the fear of making Zoya go through a gastric nightmare. And there was a bit of Fab India’s organic wole wheat pasta left, enough for two. This pasta is quick and easy. Cook the pasta until as per the instructions – which usually is boiling it in water. Add a few drops of olive oil to the water. Drain. I always run the hot pasta under some cold water. Prevents it from sticking. 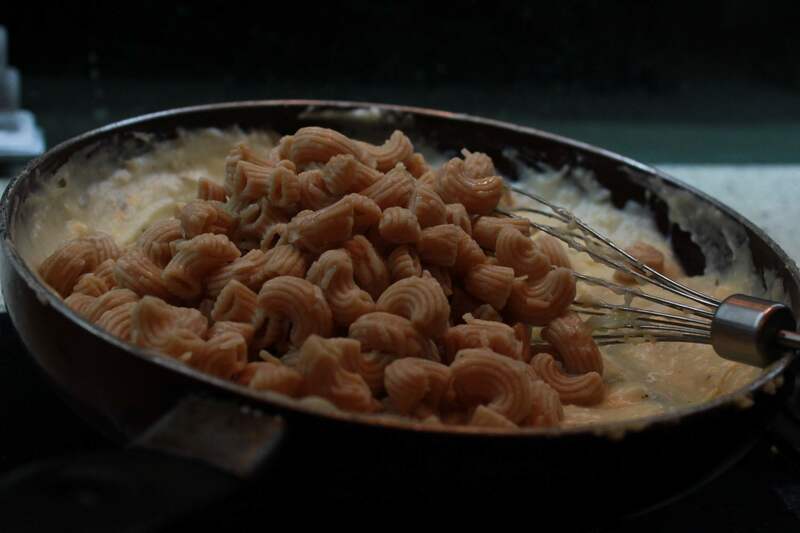 While the pasta boils, make the white sauce. This one needs to be a bit liquidy. 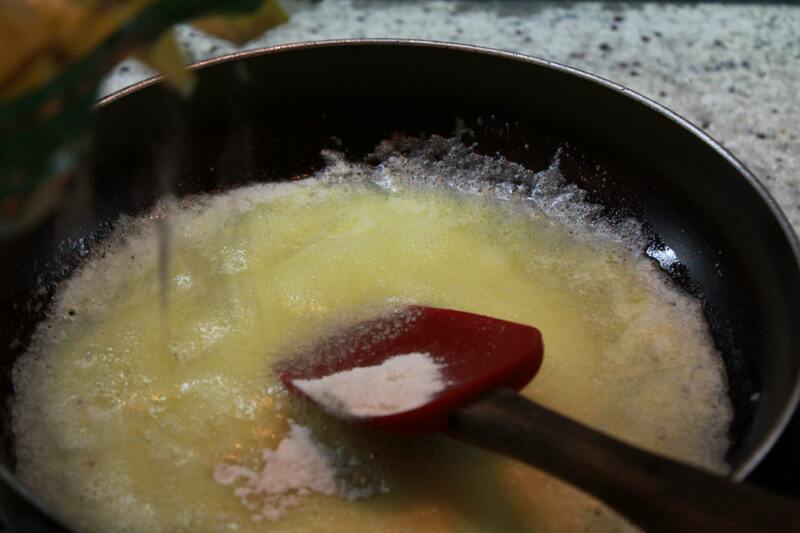 In a pan, melt 1/4 cup of butter over a medium flame. Sprinkle some flour (maida) into it, about 2 tablespoons. 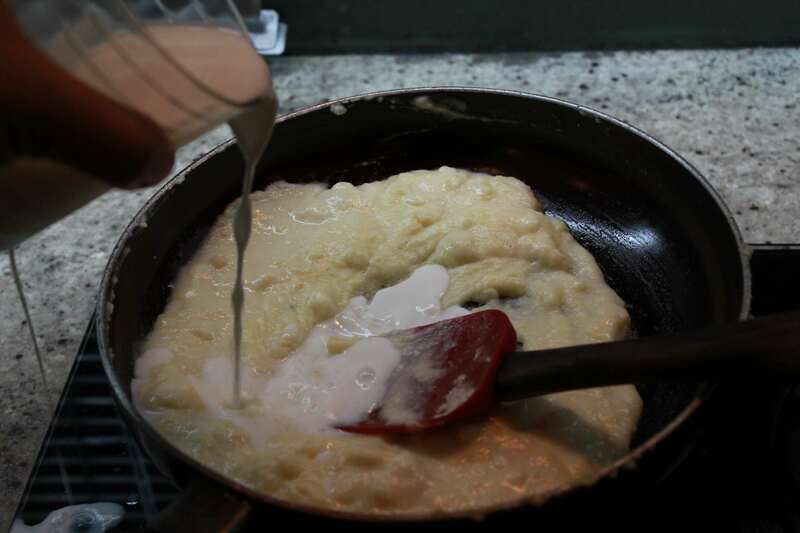 Whisk it into the butter and cook the mixture over a slow flame. This will cook the flour well and not burn it. 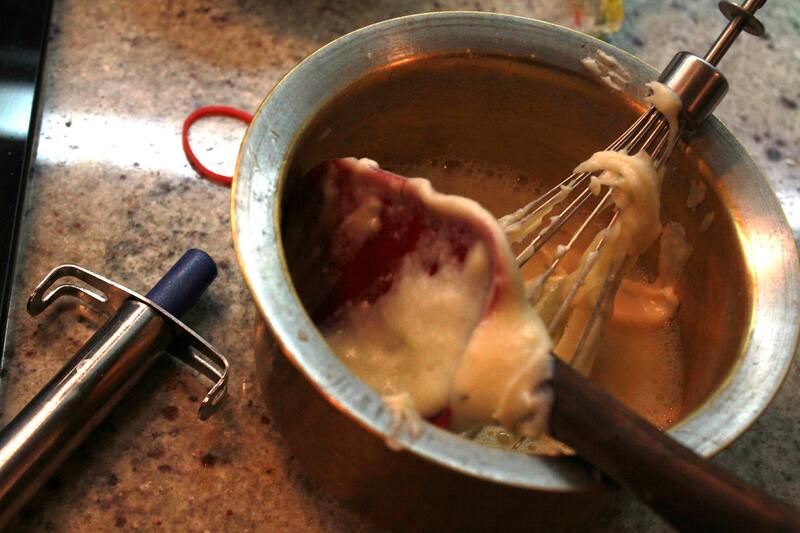 That’s what it would start looking like… Whisk it constantly so that no chunks form. You’ll be glad when you pour in the milk. 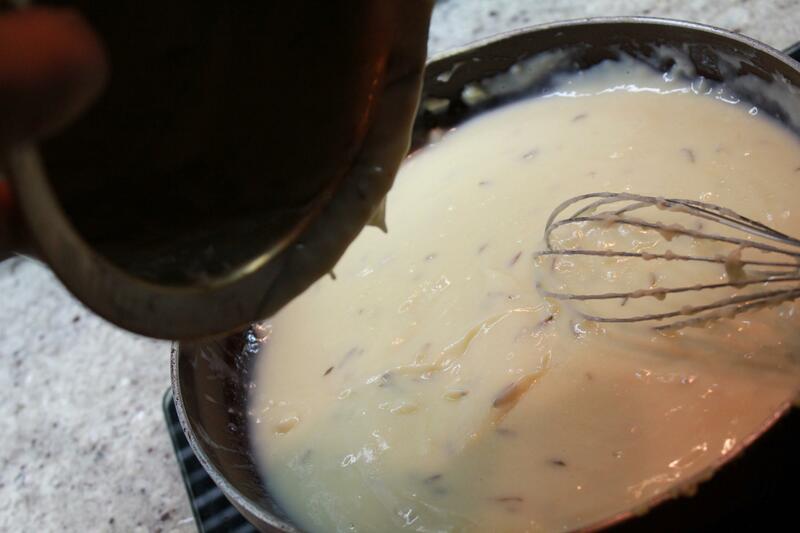 Now, add the milk, really slowly, whisking the daylights out of this mixture. You don’t want any lumps. About 2 to 2.5 cups of milk is good. Cook it till you get a thickish consistency, but not too thick, if you want the pasta gooey gooey i.e. So while all this happens, you could crush some garlic. I am found of it, so I tend to use a lot. 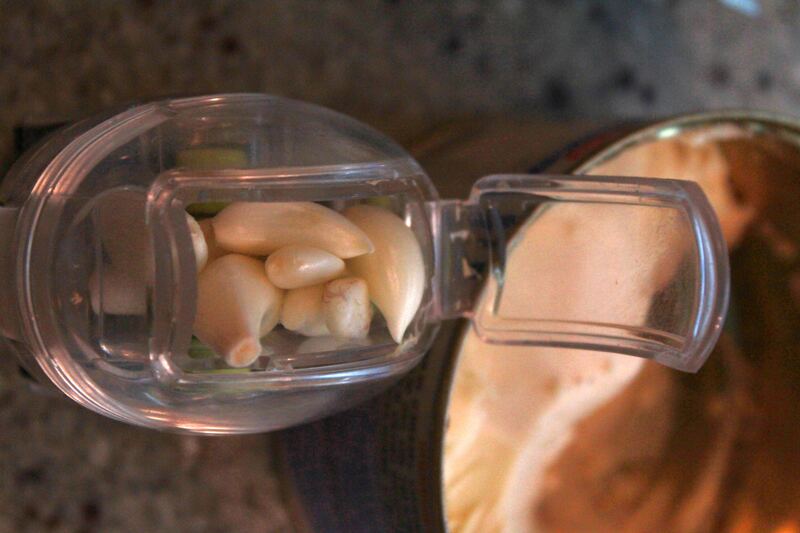 And what I show you here is a Garlic Crusher I picked up from John Lewis two years ago. 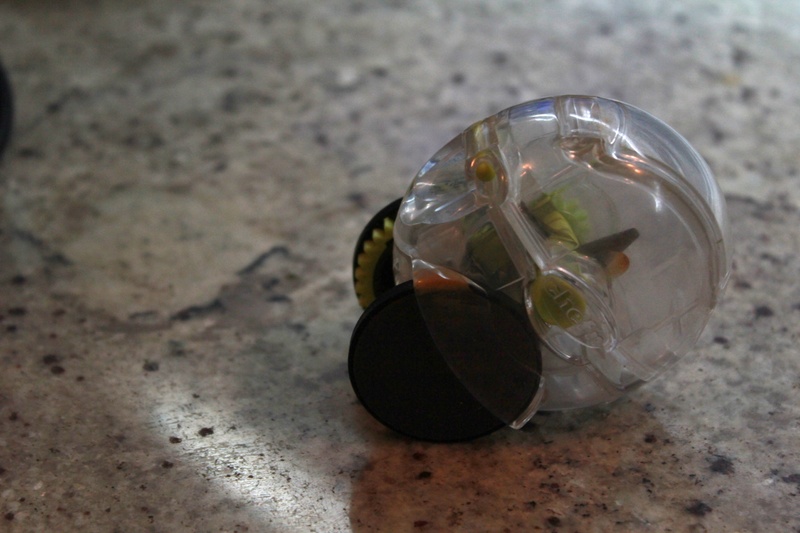 It is a great gadget, not really a crusher, but more like a chopper. Works like a toy car and gives you really tiny pieces of garlic, ideal for Chinese and all the stuff where you want tiny winy bits of garlic that are NOT crushed. Fill it with the cloves, close the lid and just run the wheel on the counter, or on your jeans, the way kids vrrrom their dinky cars all over. Vrrom.. Vrrrrrrroom.. And there you are! 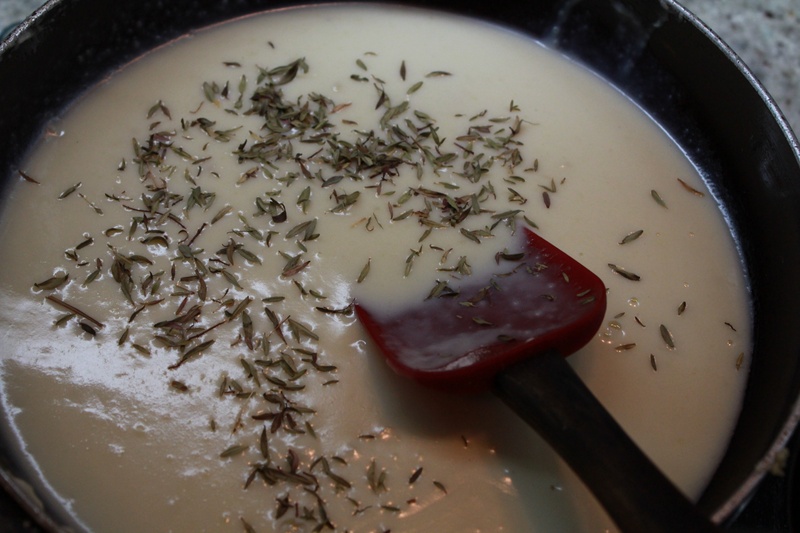 So once you have the thickish white sauce, add the garlic and fresh / dried herbs. I added dried thyme as that’s what fell out of the cupboard first. You could add some mustard as well. Gives it a nice zing. As that cooks up, quickly beat two eggs. With Zoya crying, I was not able to get a picture of the same, but imagine some beaten eggs here. 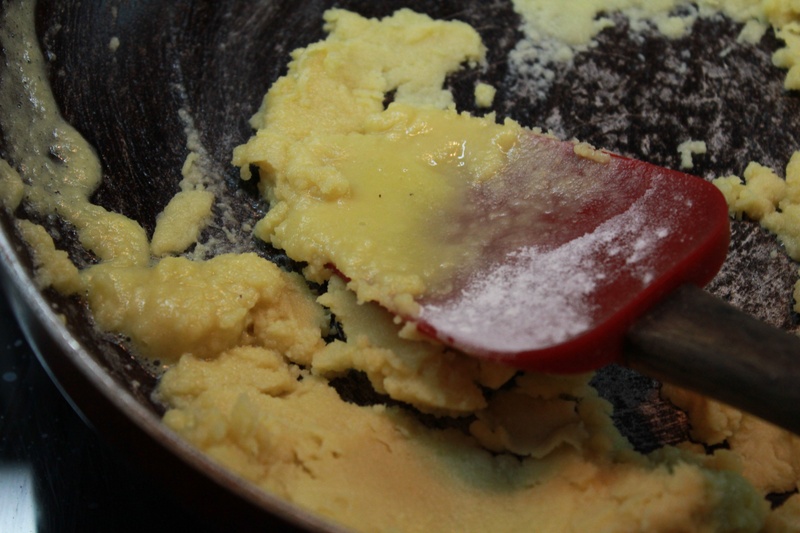 Then, take about half a cup of the sauce and slowly pour it into beaten egg, whisking it again into a smooth consistency and fast so that the heat of the sauce does not cook the eggs. 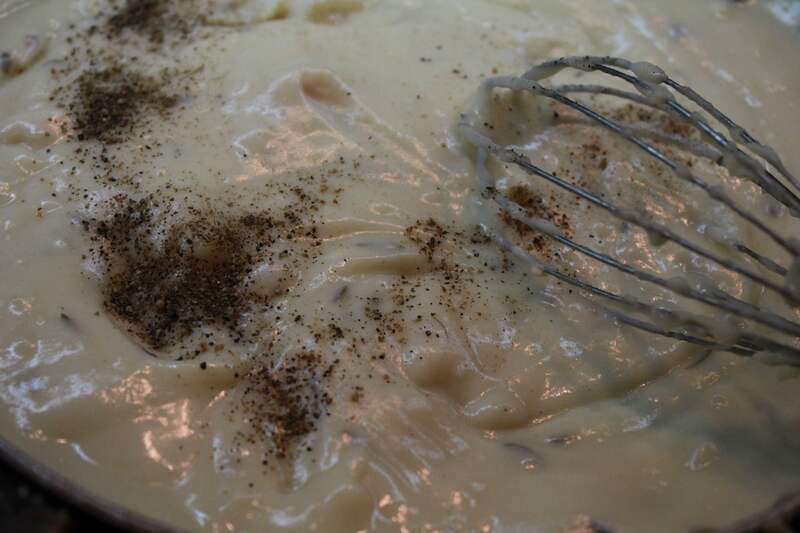 Now dunk this egg mixture into sauce, stirring it constantly till the whole mixture is smooth. Add cheese. 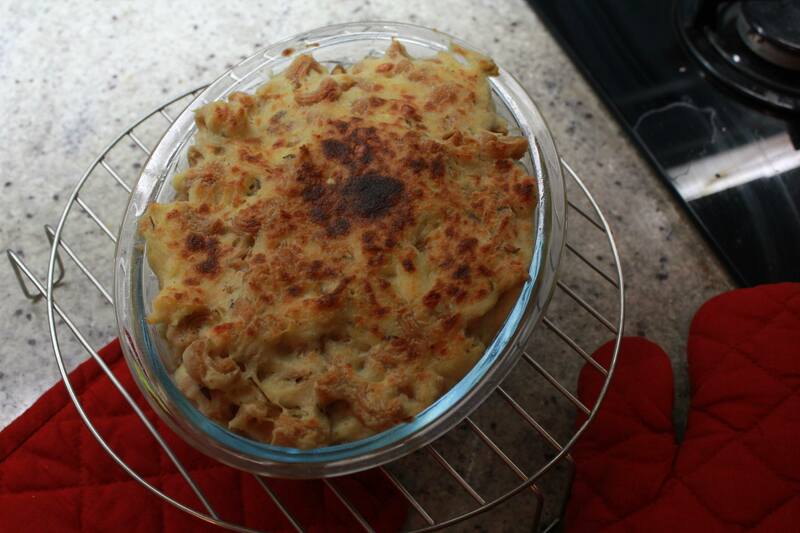 I added the usual Amul tin cheese, but parmesan works much better. Stir it till the cheese melts. and stir to melt. Add salt and pepper, the latter being freshly ground. 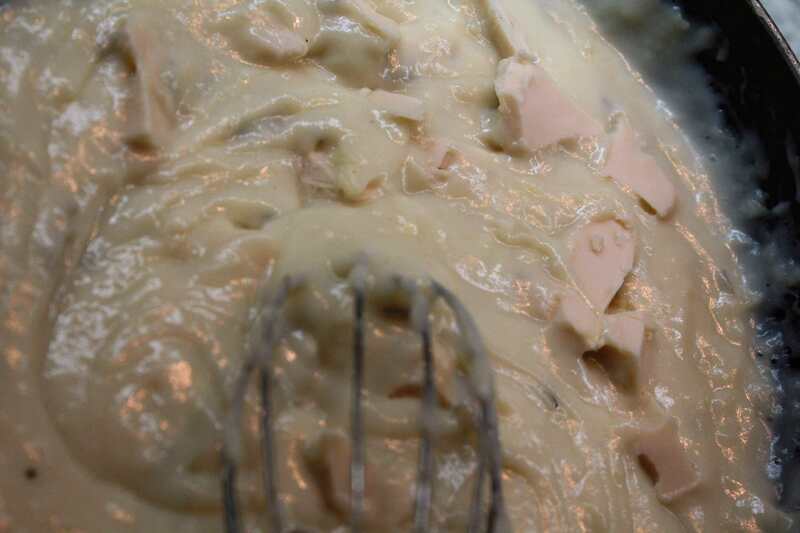 Now add the cooked pasta to the sauce, mix it well and bake it for about 20 minutes. Am not fond of standing in front of the microwave, so you just imagine the baking process. It’s rather simple. The sauce will bubble and the top will start turning goldenish brown. The next thing that I did was cook up some mushrooms and onions. This struck me right at the end, otherwise I’d probably add the mushrooms to the sauce. But well. 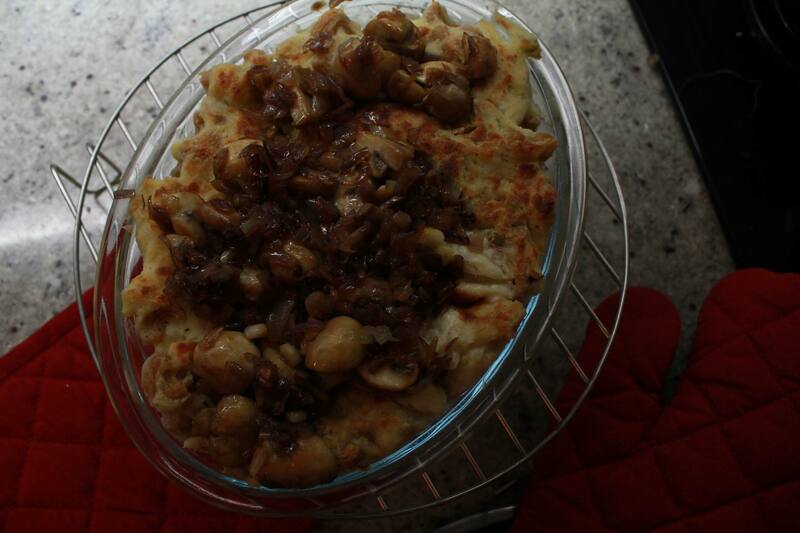 You can substitute or add spring onions as well to the mushrooms. Peas and carrots are other options. I used the same pan as the sauce, just run it under the tap. Add a dash of olive oil and sweat the onions in it. 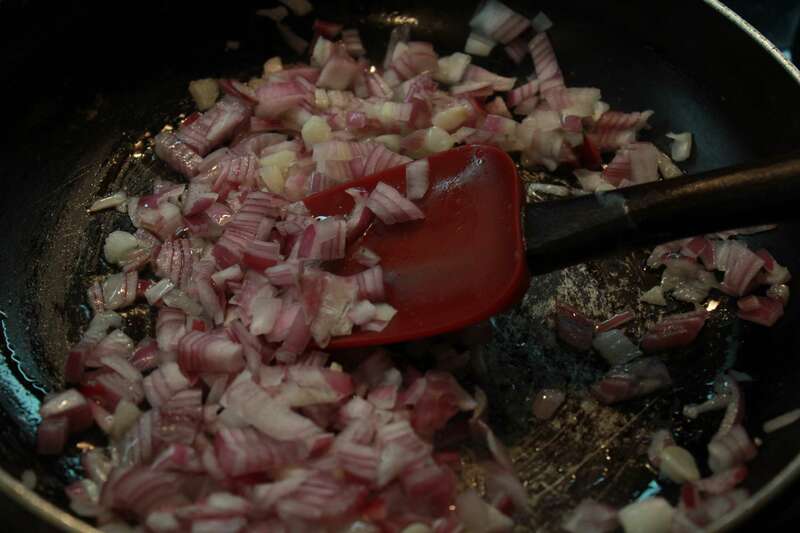 Always add a little salt to onions when cooking them – they sweat faster as they dehydrate faster. Turn up the heat to high when you add the mushrooms. Toss them around till they turn brown and glossy. The onions would have caramelized. 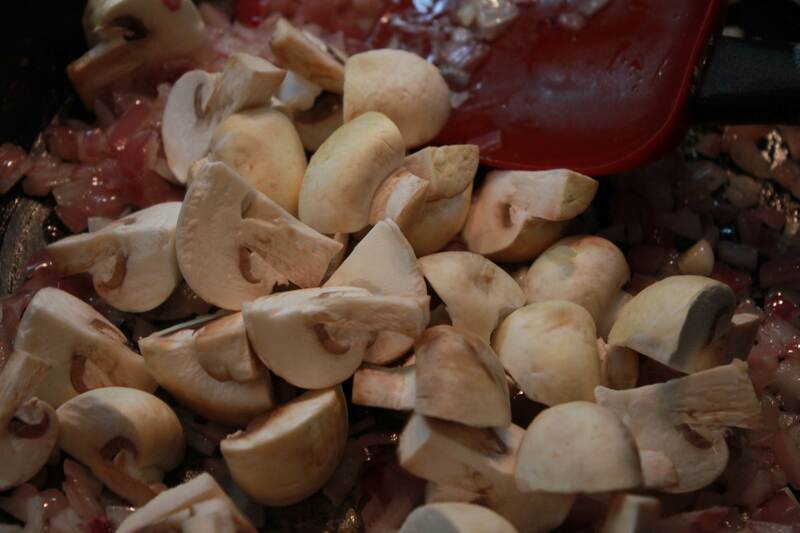 Add the seasoning once the mushrooms are cooked – they leave a lot of water, so you can go wrong with the salt. I just dunked the mushrooms and onions on top of the baked pasta. Worked as well.